INDOORS: This week, I started my Vidalia Onion seeds, and some Lacinto Kale. My storage room got cleaned out, making a nice work space to move the whole operation out of the dining room. My seeds are organized and inventoried, and a shopping list has been started. What’s on the list? Things like new seeds that need to be purchased, and wish list items like Speedling trays and another grow light. 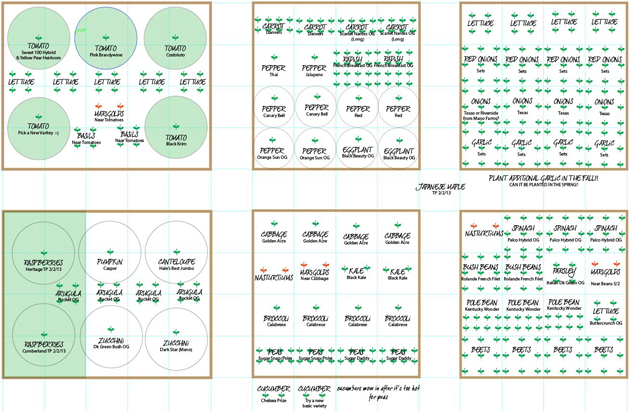 I also finished up the garden design plan, and recommitted to being a better garden blogger this year. OUTSIDE: The cover crops I planted in late fall have done really well – they’re still alive and enriching the soil with nitrogen and organic matter, waiting for me to get out there and plow them into the soil with some extra compost, and maybe a little rock dust or Epsom salt for added minerals. A pile of lovely compost was delivered by surprise from one of my fellow gardening friends (thank you!) and I have a trash can filled with composted leaves from last year. So, lots of yummy goodness is ready to nourish the soil. What do you think of my garden plan for the year? I never follow it exactly, but having a map is better than getting lost, right? Thanks for blogging. I love your garden plan. So what exactly are the Epsom salts supposed to do? Hi Joan, Epsom salt adds magnesium and sulfur to the soil. Rock dust is my other option which also adds magnesium and tons of other trace minerals. I’m currently investigating both options, so check back for a post about this topic. Happy gardening!